This article examines the experiences of veterans with service-connected disabilities who encounter the disability compensation program of the Department of Veterans Affairs (VA) and the Social Security Administration's Disability Insurance (DI) program. The authors use matched administrative records from both agencies to track the characteristics and experiences of veterans who received VA ratings of “totally disabled” during fiscal years 2000–2006, focusing on the timing and outcomes of their applications for DI benefits and the prevalence of the primary diagnoses identified by both programs. The authors pay special attention to diagnoses of posttraumatic stress disorder and traumatic brain injury. This article examines the in-kind support and maintenance (ISM) received by Supplemental Security Income (SSI) program applicants and recipients. 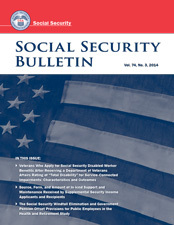 Social Security defines ISM as unearned income received by SSI applicants and recipients in the form of food and/or shelter from anyone living within or outside their households. About 9 percent of SSI recipients have their benefit rates reduced because of ISM during any given year. Using data from the Modernized SSI Claims System, the author quantifies the source, form, and amount of ISM received by SSI recipients. The article reveals that SSI recipients are more likely to receive ISM from outside than inside their homes, receive assistance in the form of shelter rather than food, and allege assistance that is equal to or less than the current ISM caps.